Germany's Angelique Kerber in action during the match against Slovenia's Polona Hercog. Second seed Angelique Kerber brushed past Slovenia's Polona Hercog 6-2, 6-2 to power into the Australian Open second round Monday. The Wimbledon champion produced a clinical display to launch her campaign at Melbourne Park, where she won the title in 2016. The gulf in class between Kerber, a three-time Grand Slam winner, and world number 92 Hercog was apparent as the German took an early break then rattled past her opponent in 72 minutes. 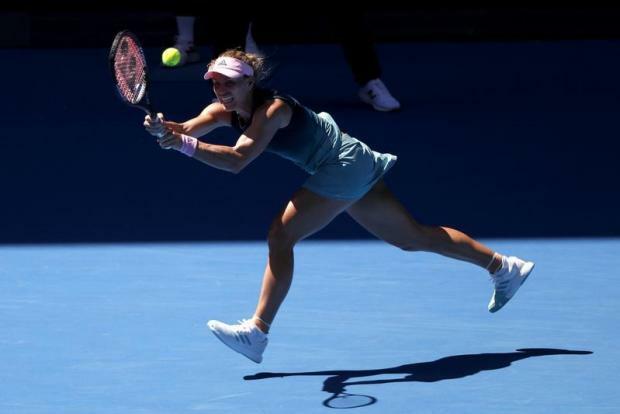 Kerber maintained constant pressure to snuff out any challenge from Hercog, saying she felt energised returning to Rod Laver Arena, where she won her first major three years ago. "Every time I walk on this court I have great memories and such a special feeling, I really enjoy playing here," she said. Kerber reached the semi-finals at the season-opening Grand Slam last year, blowing two match points before losing 9-7 in a tense last set to world number one Simona Halep. She has played down expectations ahead of this year's tournament but displayed strong form reaching the quarter-finals of this month's Sydney International. She is also one of the few players with a proven record in Grand Slam deciders against Serena Williams, defeating her in the 2016 final at Melbourne Park and last year at Wimbledon.